Comedian Bill Cosby was found guilty of sexual assault on Thursday. A jury of seven men and five women convicted Cosby of drugging and molesting former Temple University employee Andrea Constand at his Cheltenham Township, Montgomery County home in 2004. The verdict in Cosby's retrial came after 14 hours of deliberations. His initial trial resulted in a hung jury last June. 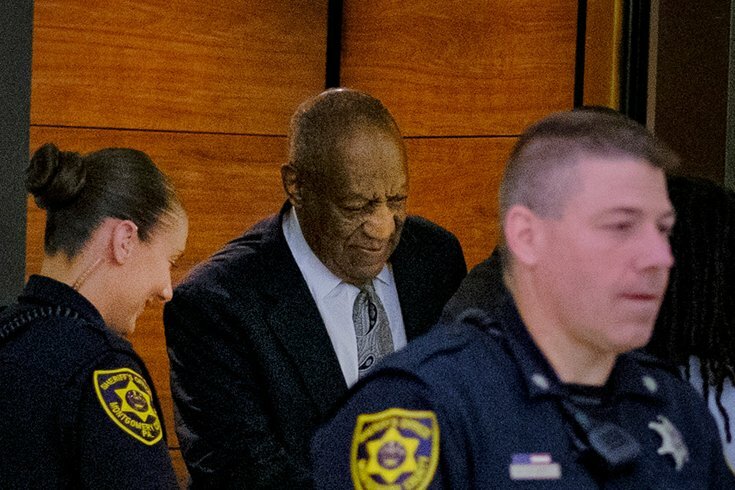 Cosby, 80, was charged with with three counts of aggravated indecent assault. He claimed his encounter with Constand was consensual. But the jury ruled otherwise, convicting him on all three counts. Cosby could get up to 10 years in prison on each count. He posted bail and was released, according to NBC News. Constand's attorney, Dolores Troiani, hailed her client's courage during a press conference following the verdict. Constand did not speak, but stood by Troiani's side. "She came here 14 years ago for justice," Troiani said. "I am so happy today that I can say although justice was delayed, it was not denied. It took a lot of courage for her to come back and do this. There are so many people who expressed their admiration for her." Throughout the trial, Constand received praise for her calm and graceful demeanor, Troiani said. But that did not come easy. "That's something she's had to work out every day since January 2004," Troiani said. "This is a life-altering experience for any woman, any victim. The person who I think needs to be heralded for what she has done is Andrea." Cosby exited the courtroom around 2:35 p.m. – a little less than an hour after the verdict was announced. He raised his right fist and held his cane as he exited the courthouse. His lawyer, Tom Mesereau, briefly addressed a throng of reporters. He said Cosby's legal team will "very strongly" appeal the verdict. "We are very disappointed by the verdict," Mesereau said. "We don't think Mr. Cosby is guilty of anything. And the fight is not over." With that, Cosby's legal team led the comedian into an SUV that drove off from the courthouse. Montgomery County District Attorney Kevin Steele addressed reporters shortly after 3 p.m., saying "we're finally in a place to say that justice was done." Steele praised Constand for the courage it took to testify against Cosby, saying she resiliently faced "horrible and unfounded attacks" against her and her family. And he said the trial uncovered the "real Bill Cosby" behind the moralist image presented by the comedian, made famous by his fatherly role as Cliff Huxtable on "The Cosby Show." "He used his celebrity," Steele said. "He used his wealth. He used his network of supporters to help him conceal his crimes. We know today who was behind that act, who the real Bill Cosby was." Cosby's trial marked the first major prosecution of the #MeToo movement, though the accusations began mounting years before the movement took off last fall. More than 60 women have accused the comedian of sexual assault. Their allegations span five decades. But Constand, a former Temple women's basketball administrator, is the only one to have her case go to trial. Constand, 45, testified that Cosby drugged her with three pills that left her immoblized and unable to resist him as he penetrated her with his fingers, according to the Associated Press. Unlike the initial trial, Montgomery County Court of Common Pleas Judge Steven O'Neill permitted six accusers to testify against Cosby in court. Only two accusers, including Constand, testified at the first trial. Heidi Thomas, Janice Baker-Kinney, Chelan Lasha, Janice Dickinson and Lise Lotte-Lublin all told the jury how Cosby drugged and sexually assaulted them in a controlled environment. Gloria Allred, an attorney representing three of the accusers who testified, called the verdict "the happiest I have been about any court decision in 42 years." "I just want to say it's been a very long journey," Allred said. "But this is an herstoric event. This was herstory – not his story, not history. But the story of her – the story of Andrea Constand, the story of all those who took that risk against a rich, powerful, famous man." Allred also read statements from Baker-Kinney, Lotte-Lublin and Lasha. "I am extremely grateful to see that the jury was able to see past his defense attorney's lies," Lotte-Lublin said in her statement. "I truly hope that his long list of victims will now be able to find some kind of peace."